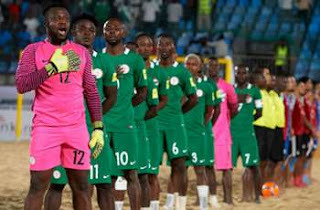 Senegal have won the 2016 CAF Beach Soccer Africa Cup of Nations after defeating hosts Nigeria 8-4 in Sunday's final at the Eko Atlantic Beach Lagos. It is Senegal's fourth Beach AFCON title. The win is also Senegal's fourth straight win against the Sand Eagles. The Man of the Match award went to Senegal's star man, Babacar Fall. The game had a frantic opening with both teams trying to get on the scoresheet which did not yield any goal. Senegal eventually took the lead through their danger man Babacar Fall in the fifth minute. But the Sand Eagles equalised a minute later through skipper Isiaka Olawale. Senegal took the lead again this time off Mamadou Sylla with two minutes left, but the Sand Eagles came from a goal down to level up thanks to Suleiman Mohammed. And with seconds left in the first period, Ogbonna Emeka put the Sand Eagles 3-1 up. In the second period, Senegal came from 3-2 down to take the lead following goals from Hamidou Barry and Lansana Diassy in the sixth and seventh minute respectively. The Sand Eagles clawed their way back as Mohammed leveled up to make it 4-4. In the third period Senegal went ahead through Sylla in the second minute for his second goal of the final. And towards the end of the third period it was Senegal all the way as Fall, Sylla (brace) and Papa Ndoye scored to give Senegal an unassailable lead.